Posted on November 11, 2011 at 9:31 pm. This is the first in a category of posts about different projects that i’m building. Some projects are things that i’m creating and some are kits designed by other folks that I’ve purchased and put together. For other project posts see the projects category. 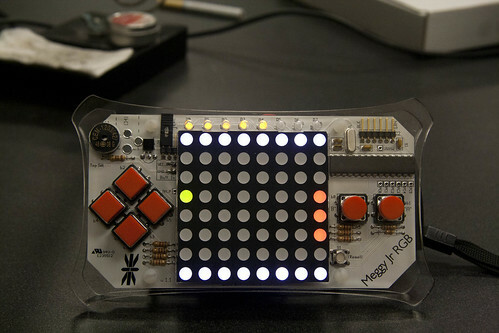 The Meggy Jr. is a handheld, LED pixel-based game development kit made by Evil Mad Science. After finding out about the Meggy Jr. from a member of my hackerspace, TC Maker, I purchased one as soon as I got home. The 8×8 LED matrix just seemed so old school and amazing that I had to have one to play with. I finally received it and then it sat, on my bookshelf, for over a year. Even after having built a workbench in my living room for soldering projects, the Meggy languished under a pile of electronics parts. Finally, after moving back to Minneapolis, MN and re-joining up with TC Maker I finally got to putting my Meggy together. Hacker mojo is something that requires some diligence to maintain; if you don’t use it you lose it. Recently, Paul Sobczak and I started an Electronics Hacking Night (eHack Night) at TC Maker. It’s been a great motivator and platform for getting back into electronics hacking. Kits like the Meggy Jr. are perfect for sharpening up soldering skills and getting the creative juices flowing again. Building the Meggy was a fun experience which I managed to complete in one evening. Evil Mad Science puts a lot of thought into the end result of their kits as well as the build experience. I wasn’t planning on this post when building so I’m lacking some build photos. The Meggy comes with a game pre-flashed on the Atmega 328, “Attack of the Cherry Tomatoes”. This makes it fun to play straight out of the box build process. I’ve also uploaded a game of snake to my Meggy which can be found on the Evil Mad Science website. Coworkers, family and friends have all been wowed with the Meggy. After I tell them that I built it they get even more curious, even those that know I like to tinker with and build things. I look forward to trying out some other games people have already made and trying something new myself.